When you think of two-door SUVs, what comes to mind? That ungainly 2-door Ford Explorer they sold for a decade? The Isuzu Amigo? The Jeep Wrangler? Well, how about the two-door Land Rover Freelander? That’s right. 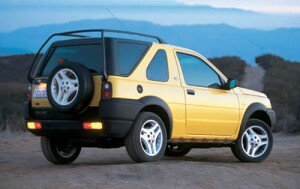 Everyone forgets about it, but the two-door Freelander very much existed – even in the United States. 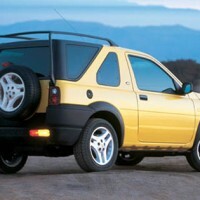 It was one of many failed two-door SUVs, a group that also includes the Toyota RAV4, Kia Sportage, Isuzu VehiCROSS, and dozens upon dozens of others. Unfortunately, the Freelander itself was an awful, underpowered, trucky SUV with terrible gas mileage, a bad interior, and a transmission that was destined to fail no matter how many times you replaced it. As a result, I’d be stunned if there are ANY Land Rover Freelanders left in this country five years from now. But I’d especially be stunned if there are any two-doors. A quick check on AutoTrader.com reveals about 80 percent of Freelanders are four-door, meaning only a small number are two-doors. A quick check on AutoTrader.com also reveals you can pick one of these up for around six grand, regardless of mileage or condition. That’s a pretty good deal, though I must remind you to budget for a new transmission. And then another new transmission a few years later. I know you love your Land Rovers Doug, but whenever I hear those words all I can think of is calling AAA by the side of the road. I don’t remember ever seeing a two door one of these. Well don’t expect to start seeing them now!! At least they got ride of the Freelander and replaced it with something more superior…the LR2. In no way similar to the Freelander because it says ‘LR2′ on the tail. Hah. The LR2 is, at the very least, mechanically better than the Freelander. I admit otherwise both cars are fairly mediocre. The LR2 uses a completely different drivetrain. It uses the 3.2L I6 and transmission from Volvo. I know its proven to be more than adequate (even in much larger packages such as the XC range) and reliable to boot. Ah yes, the LR2. They should’ve just called it the Cimarron. We were all thinking it anyways. From the majestic Range Rover to the tough LR3 to the… huh? Is that a Ford? No, after looking at the price tag, it is obviously not. I nearly purchased a used 2 door back in 2007. The interior was cool! The sunroof was nearly the width of the front of the cabin and it was split so you could open one side or the other… or both. Passenger and driver had control of thier own side. Also, the lack of carpet gave it a Jeep feel. Bare in mind, that’s the last time I’ll use Jeep and Freelander in comparison… unless we’re discussing transmission failures. Every time I see a Freelander/LR2, I have to wonder if they still make them. And if yes, does anyone know why? One thing I’ll never understand are those dummy taillights on the Freelander, when the lights that actually light up are on the bumper. Every time I see one of these, I feel like the taillights are burnt out. Since I saw it on I think that this is the best car for mountains . I remember back in 2006 or so, there was a local Land Rover dealer advertising “new Land Rovers from $19,999″. Digging around their website, I discovered they had 2 unsold, 2 year old 2 door LR2′s. I thought about taking a look, but then I figured they probably went unsold for a reason. I had a 2-door 2000 Blazer, stripper model with a stick-shift, crank windows and A/C. Rough as a cob, but faithful and endearing. The main difference between the Chevy and the LR2 was that the Blazer claimed to be nothing more than it was, while the Land Rover promised status, romance (or at least getting laid) and off-road prowess. Nevertheless, no one will miss the LR2, while there are probably many like me who will gladly recall memories of bouncing and creaking along in the Blazer. If someone want one, you can buy one over here for as little as 2000 euro because nobody want one. The build quality is as bad as the early Leyland cars, the engine is weak and the dashboard is made from 1980′s american plastic. Hi, can anyone recommend a 2-door SUV with a boot that lifts upwards and has low fuel consumption. I own a 2004 mazda tribute luxury v6 and have (and still do) love it. The reason we can no longer be together is that its fuel consumption is just too high. I’m looking at a 2-door opt because I don’t need the extra length. I never use the back seats except for my dog, bike or surfboard.